The European Union’s competition sprawl is as worrying as Google’s. Trustbusters on Wednesday accused the $360 billion web giant of favoring its own shopping search results – and broadened the case to include its Android mobile operating system. Investigations and appeals may take a decade. Brussels is going down the same treacherous path as ever-expanding Google. For five years, the California-based company has been defending itself in Europe. Following the statement of objections, Google must respond within 10 weeks. If the European Commission opts to fine Google or demands changes to how it conducts business, it can appeal. In the meantime, investigations continue into whether Google hurt rivals by scraping content and advertisers by restricting their options. Microsoft’s tortuous battle gives some indication of how long and hard the fight could be. What’s more, Europe started a new clock by opening a formal investigation into whether Google uses its mobile dominance anticompetitively. Android powers about 70 percent of smartphones and tablets in the EU, according to research outfit Kantar. The Commission fears Google locks in consumers by preventing manufacturers from producing different versions of Android. It further cements control, according to the EU, by tightly tying Google’s services and applications with those distributed with the operating system, thus extending Android’s influence to control other markets. The concerns are legitimate. If a tech company wants to expand its pre-eminence to adjacent areas, bundling software and tying it to other services is an effective way to do so. That’s what Europe found Microsoft doing, by including a browser with its operating system and preventing interoperability. Even so, Android’s position could be slipping. The latest Kantar figures show small gains in Apple’s popularity. An effective antitrust case often depends on presenting the strongest evidence quickly. That’s even more important in technology, where monopolies rise and fall faster. Europe instead is pursuing multiple strands against Google, some of which are bound to be weaker and take far longer to bear fruit, if at all. It is evocative of the EU’s target. Google keeps straying from the one thing it does well, which made it so successful. Self-driving cars, drones, biotechnology and more increasingly look like distractions. 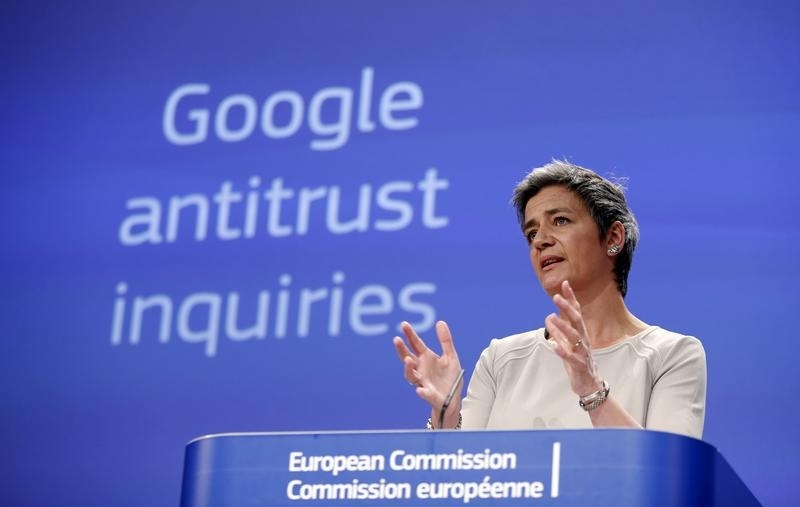 Both the EU and Google could be undone by their own ambitious lack of focus. The European Commission on April 15 formally accused Google of violating competition rules by distorting search results to favor its own shopping service. Existing investigations also will continue into whether Google harmed rivals by scraping their web content, placing harmful restrictions on advertisers and demanding exclusivity from advertisers. In addition, the Competition Commission launched a formal antitrust investigation into Google’s Android mobile operating system. It centers on whether the internet search giant hurt rivals by requiring operators to pre-install its services, if Google prevented device manufacturers from producing “forked” versions of Android and whether the company hurt competitors by tying or bundling Google services with other Google applications. Google has 10 weeks to respond to the statement of objections and can demand a hearing. If the commission finds Google guilty, it can fine Google up to $6.6 billion, or 10 percent of the company’s revenue last year, and demand sweeping changes in its business practices. A final resolution could take years if Google appeals.